Despite my love for organization, I am almost always late, and my husband is no better. To give you an example, we were both late to our own wedding. As a result, our children are also almost, always late. I say this so that you will understand the Herculean effort it has taken for me to write this blog post. 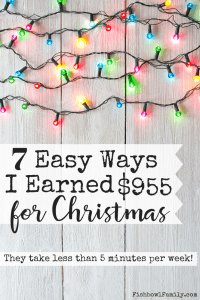 This post about ways to earn extra Christmas money contains affiliate links for your convenience. This means that if you click on a link and make a purchase, we’ll receive compensation at no additional cost to you. You can read our full disclosure policy here. It is months away from December, and I’m writing about Christmas. Not only am I writing about Christmas months before Christmas, but I’m also writing about the things I started doing a year ago to earn extra Christmas money! I want Christmas to be magical and wonderful for my children just like every other parent, but I don’t want to spend so much money that we have to spend the rest of the year paying off that magical and wonderful Christmas. So, last January I committed to finding ways to save for Christmas without affecting our regular budget. Obviously, putting a set amount of money back each month for gifts – Christmas, birthdays, etc.- is a great plan. Dave Ramsey recommends it, so it’s basically a financial no-brainer. We have done this the best that we can for several years, but some months putting cash back for future gifts takes a backseat to medical bills and new tires. However, my goal was to find ways to have a free Christmas! Have ya’ll heard of a no spend month? Well, these are the seven ways my family is going to have a no-spend Christmas. What it is: Ibotta is a free app for your phone that gives you money back (in the form of a gift card or PayPal transfer) on the things you buy at a store. In my experience, it’s primarily grocery rebates with a few restaurant and clothing rebates. I expect that Ibotta will add more rebates as they continue to grow. My experience: I primarily shop at HEB for groceries and I earn about $1- 2 per trip. There are people that get way more than that because Ibotta offers tons of bonuses based on brands, the number of rebates redeemed, or team member activity. The reason I don’t get more money back is because I don’t buy a lot of name brand food. We are trying to eat healthier so most of our groceries are whole foods which only get about a $.25 rebate per item. If you buy the name brand foods, they often have $1.00 rebates! That’s not to say I never buy foods like that. They’ve had a Goldfish rebate every week for the last month and HEB has had them on sale with a coupon so our pantry looks like a monochromatic aquarium. Time Commitment: It only takes me about three minutes as I’m unpacking my groceries to scan the necessary barcodes and upload my receipt. Annual Money Made: I anticipate $75 – $100 this year. I’ve recently activated the team earning option so that I can benefit from my friends’ rebate redemption and that has increased my bonus earnings substantially. Ibotta also rewards you for referring friends so that is a really quick way to make $5! Not only that, if you use a referral code to sign up, you earn $10! If you’d like to join my team, click here, or download the Ibotta app and type in my referral code: nwrfuus. What it is: Receipt Hog is an app that allows you to simply photograph and upload your receipt. They reward you with coins based on the amount you spent at the store. You exchange the coins for an Amazon gift card or a PayPal transfer. They also offer bonuses for uploading a certain number of receipts each month and you get chances to spin the “Hog Slots.” This is a virtual slot machine that you can win prizes in value from five extra coins to the dollar value of your entire last shopping trip. My experience: I haven’t been as faithful with this app as I needed to be to earn to it’s full potential. The maximum amount of coins you can get for a receipt is 20 and it takes 4500 coins to earn $30. I’m good at scanning my grocery receipts because I’m already doing it for Ibotta, but I forget to scan other receipts. Time Commitment: It only takes about one minute to photograph and upload a receipt. What it is: Checkout 51 is an app much like Ibotta except that it has a limited number of offers. So once all of an offer is used up by other people, it is gone. Checkout 51 will mail you a check when your rebate total reaches $20. My experience: This app operates in almost the exact same way as Ibotta, so I’ve found it to be very easy to use. My only complaint is that sometimes I see a rebate before I go grocery shopping, and then when I get home to redeem it, it’s gone. Time Commitment: About two minutes per shopping trip. Annual Money Made: I’ve only been using this app for about a month, but I’m on track to earn $20 before Christmas. What it is: Ebates is a website that offers percentage based rebates at online retailers. You simply set up an account, and then, visit Ebates first whenever you need to do online shopping. From their site, you click on the website you will be shopping at and they open it for you in a new tab. Any purchases you make that meet the specified criteria earn you money back. This is a perfect earning option for people that do a lot of online shopping! I’ve had people ask me why Ebates would just give you money for clicking a link on their site and the answer is actually pretty simple. Ebates is an affiliate for all of the sites so they get a commission on your purchases. They incentive using their affiliate links by sharing that commission with you. 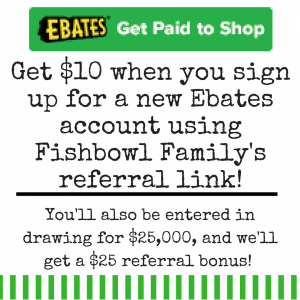 Ebates also has an awesome referral program. When you refer someone, you get $25 added to your account, and they get $10 added to their account (after they make their first purchase). If you’d like to use my referral code, click here. As soon as you get your account set up, you can start referring friends. In addition to the $25 referral bonus, Ebates is giving away $50,000 to a lucky user this quarter! Read more about it here. My experience: This is an incredibly easy way to earn some extra money. Every time I need to make a purchase online, I just go to ebates.com first, find the website I’ll be shopping at, and click on it. Ebates does the rest. It automatically opens a new tab for me and tracks my purchases. What it is: Many stores offer gift cards or other cash reward programs for shopping at them. Each store will have different policies and procedures for this. The point is to save that extra money and put it towards Christmas gifts. My experience: The two main stores I shop at are Target and HEB so I’ll tell about each of those. With Target, they offer weekly promotions where you buy a certain number of a certain item and you earn a Target gift card. Whenever there is an item that I’m already planning to buy (diapers, toilet paper, shampoo, etc. ), I go ahead and buy the amount required for the gift card. I then keep all of the gift cards in a safe place and take them with me when I go Christmas shopping! With HEB, you earn points each quarter based on your spending and special promotions. I don’t pay much attention to those and do my regular shopping, earning whatever points I earn. But at the end of each quarter, your points are redeemed for a dollar amount that you can spend at HEB. I simply look at how much I have earned that quarter and use the credit to buy a Christmas gift right then. Time Commitment: One minute per shopping trip to decide if any items I’m already buying fall under the stipulations necessary for extra points or gift cards. What it is: We use the Citi Card, but there are tons of other reward cards out there. My experience: We use the Citi card to pay for gas, online orders, and other things. We are currently using the cash envelope system from Dave Ramsey’s book, Financial Peace, for things like groceries, restaurants, entertainment, and babysitter, but for other little miscellaneous things, we pay with our credit card. We pay it off in full at the end of every month, but we still earn points for every dollar spent. The points can then be used to buy things like gift cards! Time Commitment: Two minutes a month to pay the bill and five minutes to order the gift cards. What it is: an online consignment store that takes men’s, women’s and kid’s clothes as well as toys. You mail in a box of stuff and they take professional photos of the stuff. They upload the photos, price your items, process payments, and ship out the sold items. They keep a cut of the proceeds and the remainder is given to you via Paypal or store credit-whichever option you choose. My experience: In 2016, I sent in one box of clothing. It took Swap about two months to get the stuff entered into their system. From that one box, I’ve earned about $130. *Update – In 2017, I sent in five boxes. In eight months, I earned $646.40. Swap got a lot pickier about the clothing that they accept between 2016 and 2017, so a lot of the items I sent weren’t accepted. That being said, I’m still pretty happy to have made over $600 getting rid of clothes we don’t need anymore. Although honestly. with the new procedures in place (they price your items vs. you pricing your own stuff), I’m not sure if I will continue to sell on Swap.com or if I’ll start sending my stuff to Thredup.com. I would rather get store credit at ThredUP because their clothes tend to be nicer. I’d love to hear your opinions! Time Commitment: Not counting the time it took me to clean the clothes out of our drawers, I spent about 2 hours on this project. It took about an hour and a half to box everything up and another thirty minutes to go through and price my items once they were up on the website. Swap.com also has a pretty great referral program. Each time a friend makes their first purchase using your referral code, you get $20 in store credit and they get 20% off their purchase! To use my referral code, click here. 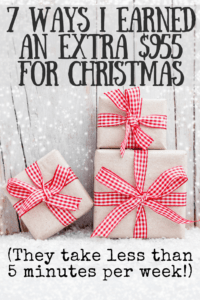 In total, I’ve made an extra $955 this year to put towards Christmas! None of the tasks were difficult, and most of them did not take more than a few minutes to complete. As a stay at home mom, I’m always looking for ways to contribute to our budget. Doing these things has been an awesome way to help ease the monetary pressure of Christmas. My husband I still work to make the focus of Christmas about serving others, and we do our best to buy gifts for our children that will help to make them into better adults. But having the extra money, does nothing to alleviate my complete and utter disdain for Christmas decorations. But that is a whole other issue. 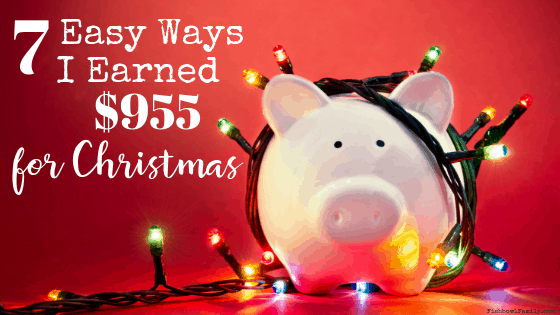 What are some ways you’ve found to earn extra Christmas money? So using some of those apps and some others I totaled up $309 towards Christmas since the middle of August ?? thanks for helping me get started! ? now it’s time to start working towards next year ? Yay!!! Great job Cara! I’m so glad that you could earn so much! I get almost all the kids clothes from Swap but never thought to send anything in. I kind of want to try now. Holly, you should! It’s super easy! Though they have changed some of their policies since I sent my last box in, so be sure to check them out. I never tried these apps. After reading this post will sure try some. Thansk for sharing the post. Thanks a lot for this list. Are all the apps US centric? I know that ibotta is exclusively for the US, but ebates is good for all other countries! If you decide to try it, be sure to use my link so you can get a $10 bonus! I love to save money! I check my credit card cash back the day after my bill ended with excitement! I enjoyed reading about your other money saving tips! Thanks! Save on! Me too, Virginia! I hope you found some of them useful! you’ve got this down to a science! very impressive savings! Thank you!! 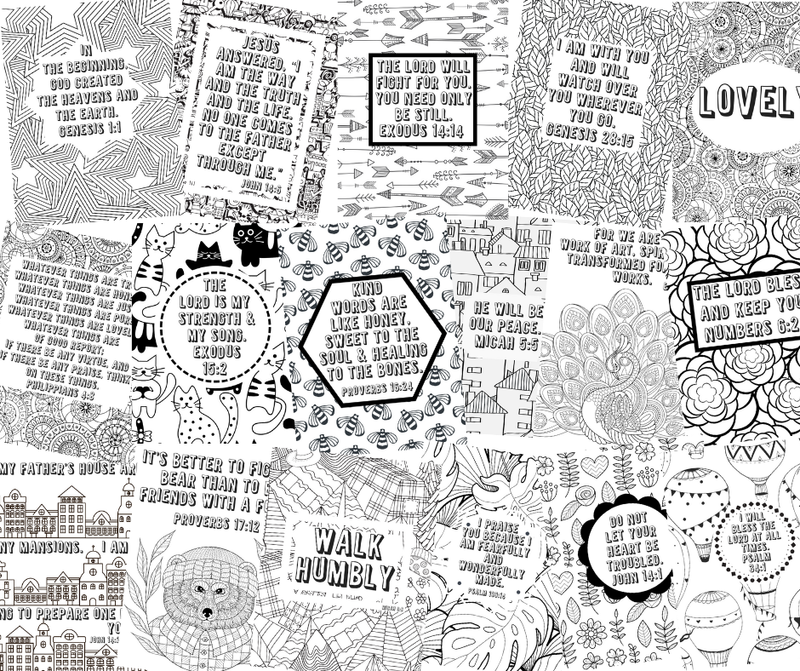 They’re all super easy or I would not be doing them. I have never heard of swap.com before… I will have to check it out!! Julia, I love selling clothes on Swap.com, but it’s also a great place to buy clothes. They have men’s, women’s, and kid’s at very reasonable prices. If you use my link, you’ll get 20% off you first order. Awesome!! I hope you are able to earn lots of extra money this year!